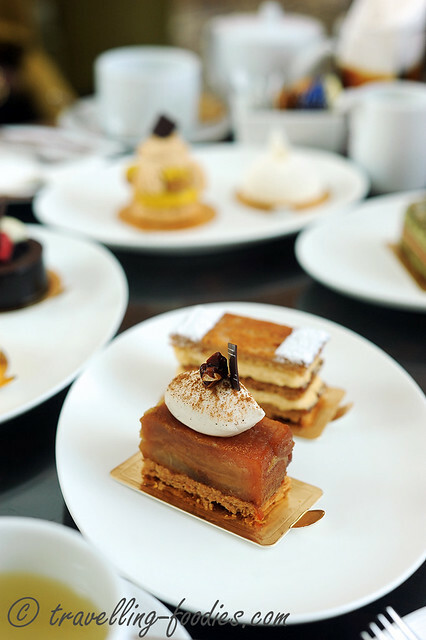 Patisserie Platine is located in the RISE lounge just next to the concierge of the prestigious Marina Bay Sands Singapore. 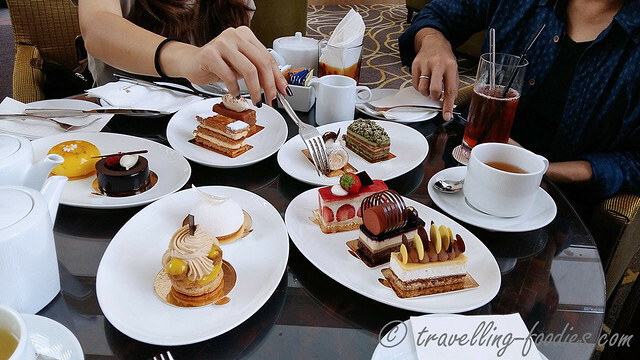 The sheer grandeur of scale and space which the hotel lobby provides sets this pastry joint apart from the other outlets. Easily up one notch if not more. The RISE Lounge is styled in a way which I would call “semi-alfresco”, within the shelter and cover of the hotel yet wall-less and without boundaries, just slightly platformed from the rest of the hotel lobby, which provided a wonderful view of the surroundings. The wall-less concept, matched by the furniture created a rather cosy and casual feel which allowed one to relax and just chit-chat a cuppa and a cake, enjoy the pastries, people watch or simply laze the afternoon away. 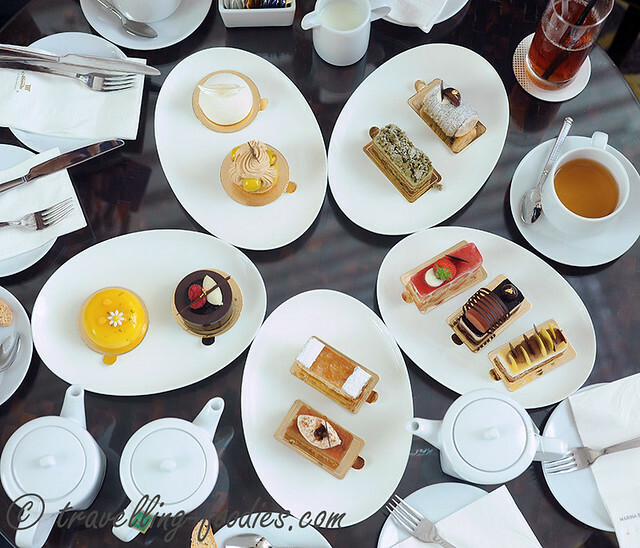 Since there were 5 of us, we ordered 11 cakes and pastry creations to share with tea to go around. 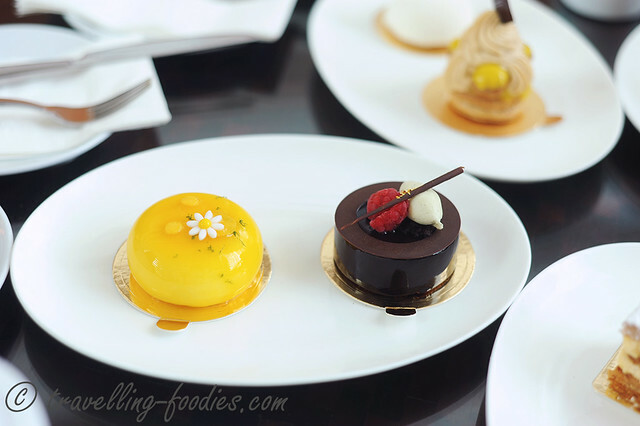 The patisserie offers tea from TWG, with a very decent selection though I’d hoped it would be bigger, especially to include TWG’s range of floral infusions which I felt would have been quite apt to go along with the cake samplings. I chose a rather mild-flavoured sencha to go with the cakes since the stars of the day are the confections after all! Tarte Tartin with Maple Syrup. We all loved this spin of the classic French dessert. The chunks of golden delicious apples were beautifully caramelised with a hint of the aroma and sugary sensations of the maple syrup. The puff pastry base was crisp and buttery, while the sweetness from quenelle of creme chantilly above acted well against the tart flavours from the apples. Overall we felt that it was very balanced in presentation and flavour. The piece on the right is a “Chocolate Mousse with Raspberry and Pistachio“. The dark chocolate mousse was the most prominent component in this piece and then the layer of raspberry coulis which paired well with the chocolate as always. There is a layer of chocolate sponge which hinted of liqueur but it was rather subtle and could have easily escaped one’s tastebuds. I had trouble finding the pistachio components in this piece, probably quite heavily masked by the chocolate ones. The presentation is once again impeccable and precise. The star of the day was the “Coconut Mousse with Mango and Passion Fruit“, like a gigantic egg yolk which had been confit to perfection, ready to burst open to unleash all of its goodness held barely within. It is aesthetically very pleasing, accentuated by the sugar flower and grated lime zest for colour contrast and that citrusy infusion into the piece. 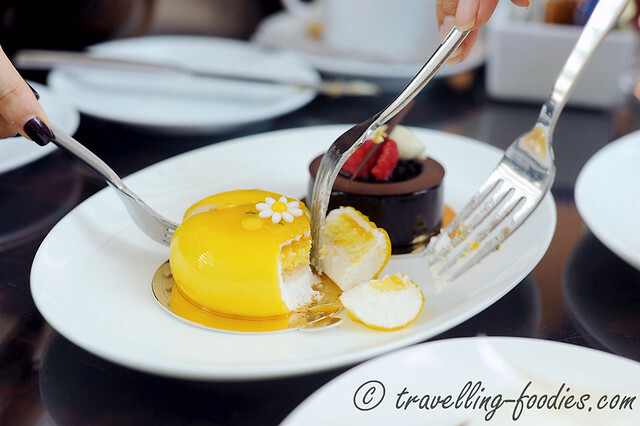 We all loved the intermingling of coconut mousse against the mango and passionfruit components. Those familiar with Japanese inspired French confections would know the extensive use of the mango-passion fruit pairing in their desserts. The sweetness of the mangoes compliments well with the zing which passion fruits provide. The inclusion of coconut cream in the mousse raised the stakes in this piece, amalgamating so well with the other two fruity flavours, instantly sending one on a trip to the Carribean sunshine by the beach. This is most definitely a must-order! Prying our forks into the piece to take a peek at what is installed for us. The layers of sponge with the mango and passion fruit components in graduated ombre yellow was so pretty! 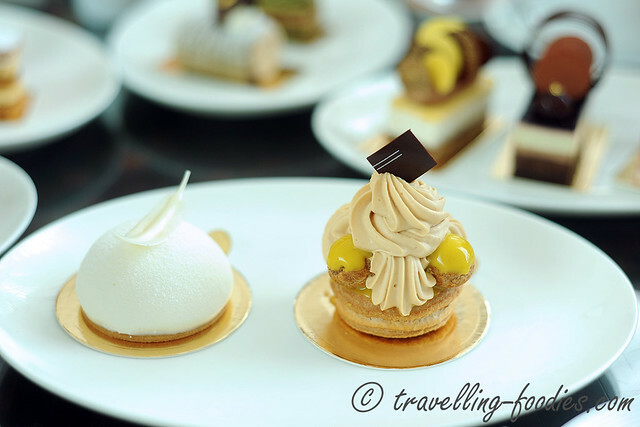 A trio of creations which we also sampled, from left to right, Chocolate Mousse with Hazelnut and Passion Fruit, Black Forest, Fraisier. Chocolate Mousse with Hazelnut and Passion Fruit was quite lovely. The dacquoise base was embedded with bits of chopped and toasted hazelnuts, exuding an alluring nutty aroma which permeated throughout the mouth upon the first bite. Then came the tart flavours and unmistakable aroma from the passion fruit curd. The vanilla mousse was a tad on the sweet edge for me while the piped chocolate mousse could have been darkerin taste profile, but probably good against the sourish hues from the passion fruit. The magic lies in the disc palets of chocolate decor above, so ridiculously thin one would think how it would be humanly possible. 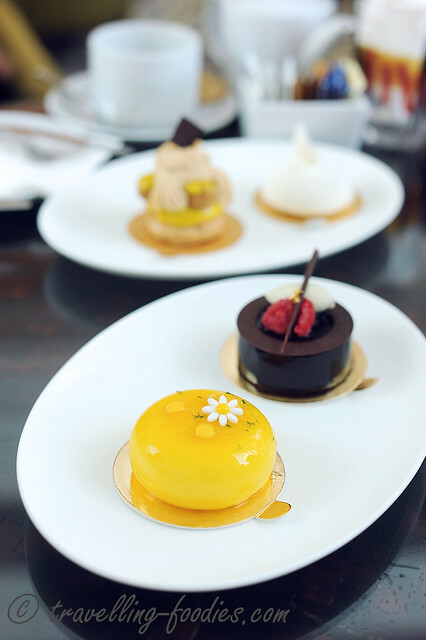 A true testament to the skills of Executive Pastry Chef Yasushi Ishino who runs the show at Patisserie Platine. The Black Forest was much much lighter than what one would expect from the classic Foret Noir. It is lighter in terms of texture, from rather fine mousse making skills, and also in taste, with a slightly downplayed dark chocolate component. The chocolate mousse takes shape with much innovation in the form of the cylinder robed with cocoa butter which sits delicately above the whole entremet. The layer of cherry gelee lacked the punch of the customary kirsch one would expect to find in a black forest gateau. The devil probably lies in that piece of morello cherry which Meng Choo had the honour of devouring. Fraisier is yet another French classic, two layers of sponge sandwiching a thick slab of creme diplomat embedded with strawberry halves. We sampled this piece first, thinking that it would probably be the lightest in taste from the spread we ordered, and we were right. The piece is simple and light in flavour, I loved the use of small strawberries, which reminded me of the ichigo tochiotome I am rather fond of. Left is one of their signatures, Ghin Cheesecake, a recommendation by the serving staff as one of their most popular desserts at Waku Ghin, next to their chocolate mousse cake which we didn’t order. The cream cheese mousse is incredibly light, flavoured through the layer of gelee au citron within. The sweetening agent, surprisingly came from the sugary coating. The base, if I remember correctly was a buttery sable. The entire piece is delicately balanced in its flavours on the whole, light yet at the same time rewarding on the palate. The right is a St. Honore, yet another classic French. Almost difficult to fault, save for the fact that I’d always preferred my choux pastry to be slightly more crisp rather than chewy. Nonetheless it was still rather enjoyable. 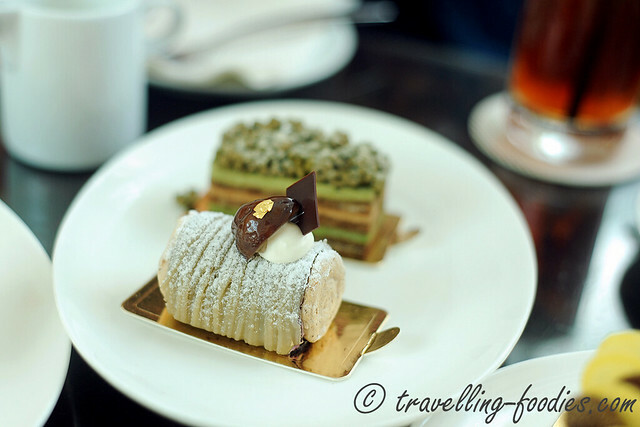 Waku Ghin’s rendition of the Mont Blanc, a deviation of the traditional “mole hill” appeal, Patisserie Platine transfomed the piece into a roll and by doing so, it became somewhat lesser of what one would have wished for in a Mont Blanc, not just aesthetically but also in taste. The chestnut cream which is what makes the dessert luscious and rich is somewhat lacking. We had mixed feelings about the piece and was equally puzzled by a thin ring of purplish layer which stood out prominently against the other earthy tones which I thought was either a puree from fruits au rouges or blackberry. Strange to find this in a Mont Blanc, though it has been done before elsewhere actually. The weakest link for all of us was the Matcha Opera. 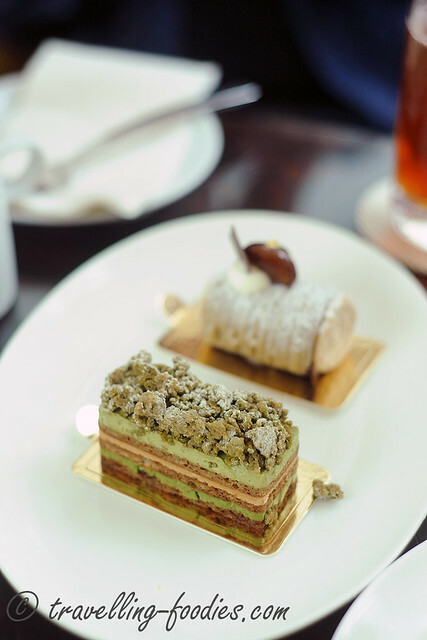 It is built like a classic Opera, lest for the prototypical chocolate mousse being flavoured with matcha instead. The joconde sponge was still soaked very generously with coffee. Too generous if you ask me, and together with the creme au cafe in between, the coffee components basically bulldozed over any fragile hinting of matcha there was supposed to be. This piece didn’t quite work for all of us unfortunately. 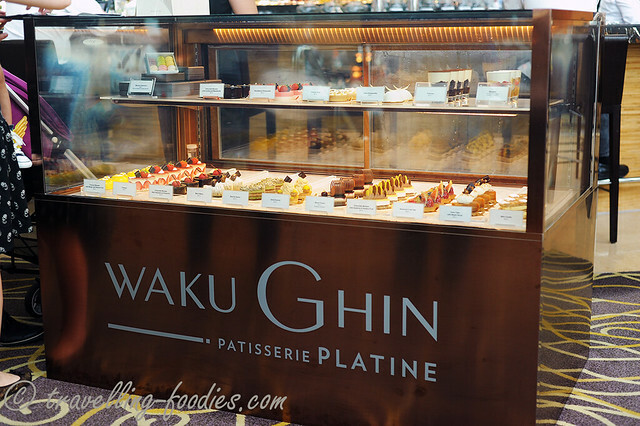 On the whole, the showcase of desserts at Patisserie Platine is a clear display of the high standards in pastry making Waku Ghin has to offer. Many pieces are very good, a few a stunning. That said, there were some misses amongst the hits. I particularly like how many classical French pieces are being represented here, some retaining the traditional flair they have been known for generations, others slightly modified to suit the modern tastebuds. 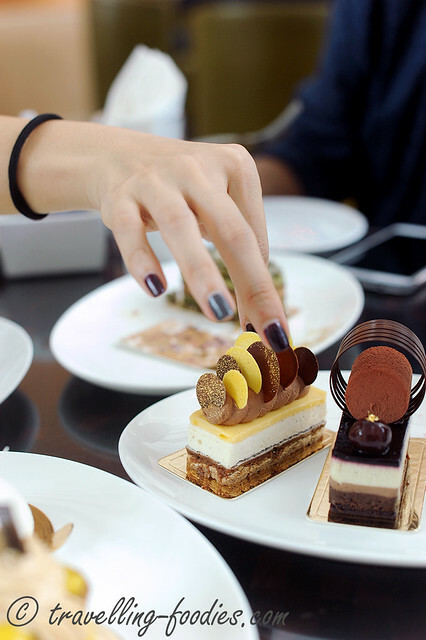 The pieces range from SGD 10 to 12+++, slightly pricier than what one would expect, when compared to even in the top dessert boutiques in Japan like Hidemi Sugino and Hideki Kawamura. But I think they are still very much worth trying, and I am pretty sure that most who would and who did would agree that they are nothing short of being enjoyable. 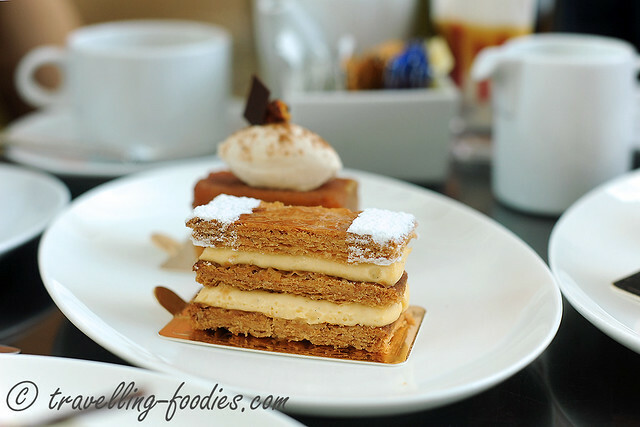 This entry was posted on November 21, 2015 by Alan (travellingfoodies). 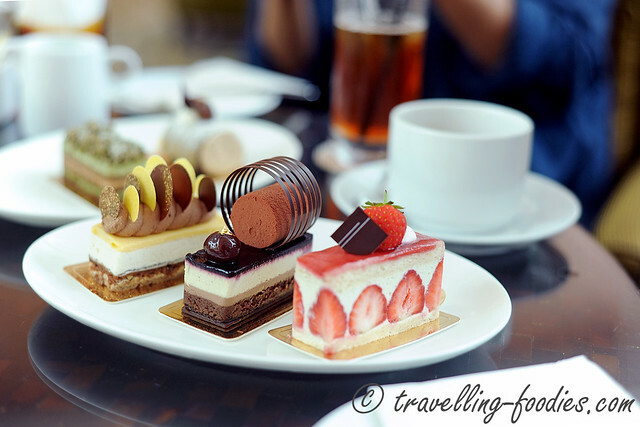 It was filed under Food, Travel and was tagged with french pastry, high tea, japanese patisserie, Marina Bay Sands, MBS, millefeuille, pastries, Patisserie Platine, pâtisserie, tarte tartin, tetsuya, tetsuya wakuda, TWG, Waku Ghin. Heya. Does the Black Forest contain alcohol?